Our 2017 Fall Forum was a success! 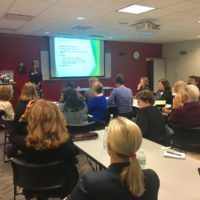 More than 70 women enjoyed a buffet dinner and networking for the first half of the night, and then, as is typical for our Fall Forums, we had two breakout sessions based on what our members expressed an interest in learning more about. 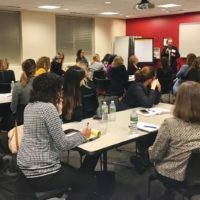 In the first, Career Strategist, Sarah Cardozo Duncan, led a lively group exercise on how to quickly make a lasting impression with new contacts. Some points we learned: Establish your personal brand through story telling. A name, a business card, a dress-for-success outfit are often forgotten. Most people remember a story, however. Weave together highlights of your career beginnings, professional achievements, and current aspirations. Be prepared to tell your story to new acquaintances with enthusiasm and good eye contact. These introductions are more likely to leave a lasting impression of you (your brand) and turn into your next job or customer lead. Some key questions to address as you develop your story are: How did you get into what you do? What kind of clients do you have? What do you bring to the table? Tell me a personal success story? In our second breakout session, Healthcare Recruiters Emmy and Phoenix and Business Development Manager Kaylee from the Addison Group presented on the modern job search. Addison Group specializes in placing candidates in long term opportunities within the business side of healthcare in staff level roles from billing to medical records. Many attendees asked questions on LinkedIn profiles and utilizing LinkedIn to its full potential, so the majority of the presentation was spent discussing this very useful job searching and networking tool. The women graciously offered their insights to attendees after the session for one-on-one reviews of their LinkedIn profiles.